The blessed month of Ramadan will begin Tomorrow | Saturday 27-May, 2017 and Taraveeh prayers will begin tonight on 26-May, 2017 right after Isha prayers at 10:20 PM so starting 01-June, 2017 (6th Ramadan) the Isha / Taraveeh time will be changed to 10:30 PM until the end of Ramadan. We are very pleased to announce that Hafiz Nathem Kashlaf from Libya will be leading Taraveeh prayers along with Hafiz Omar Naeem, Hafiz Adam Patel and Hafiz Abdul Aziz so please welcome Hafiz Nathem Kashlaf from Libya when you get a chance to meet with him. During the holy month of Ramadan, the Islamic Centre of Cambridge is holding daily Iftars for our community and everyone is welcome to signup at the office to sponsor for $200 for a day of "Iftar & Dinner" so we also need volunteers to help with serving the food for the entire holy month, please contact the office for further assistance. The ICC is working day & night to make sure that the main prayer hall is ready for Taraveeh; however, it may take another two days for the carpet installation to be fully completed so we would like to thank all the people who donated their time, effort & money towards this and if you would like to donate money for this ongoing carpet installation, then please be informed that we are still accepting donations. New Project Excavation will begin from this Monday 29-May, 2017 at 10:00 AM so please join us for this historical moment as well as for dua (Inshallah). Starting from Monday | 29-May, 2017 for the entire month of Ramadan, there will be no water bottles allowed in the Masjid & we will be settingup Water Dispensers with Small Paper Cups and you are also encouraged to bring your own reusable water bottles to fillup from the dispenser so this is done to prevent plastic waste as well as water wastage. ICC is holding a Halaqa Night for Sisters on Friday 02-June, 2017 at 7:00 PM with Aalima Dr. Saleha Gangat & Aalima Fatima Bhaiyat who will be addressing topics related to Fasting, Ramadan, Health and Hygiene. Eid Bazar is being scheduled for Friday 23-June, 2017 starting at 3:00 PM in "ICC | Hall B" and there will be ethnic food, traditional dresses & many other things for sale for everyone. ICC’s annual Fundraising Dinner will be on Saturday 17-June, 2017 at 7:45 PM in "ICC | Hall B" and Dr. Munir El Kassem will be our chief guest for the evening. The Islamic Centre of Cambridge, ICC is collecting food for the needy Muslim families & the community at large so please donate non-perishable items to help us in this cause. There will be two food containers placed in the outer lobby of the Masjid & two in the hallway outside the school office and at the end of the food drive on Friday 16-June, 2017 part of the collected food will be distributed & the rest will be sent to the Cambridge Food Bank. The Islamic Centre of Cambridge, ICC is asking the members of the community to inform us, if they are interested in staying for Aetakaaf at the Masjid and there are only 8 Spots available at this point, so please contact the office & register your name. The starting date for Aetakaaf | Thursday 15-June, 2017 and the ending date is Saturday 24-June, 2017. Eid-ul-Fitr Message from Imam Abdul Raouf Kabbar is available here. Details of activities during the month of Ramadan, please see the attached list of activities that will keep you involved during the month of Ramadan. Ramadan Calendar is also available on ICC's Official Website. Please be informed that the Early Bird Special for new school registrations will end next week on 31-May, 2017. A special request of dua for a community member, Brother Ameer Uddin Siddiqui for his complete and speedy recovery (Inshallah). 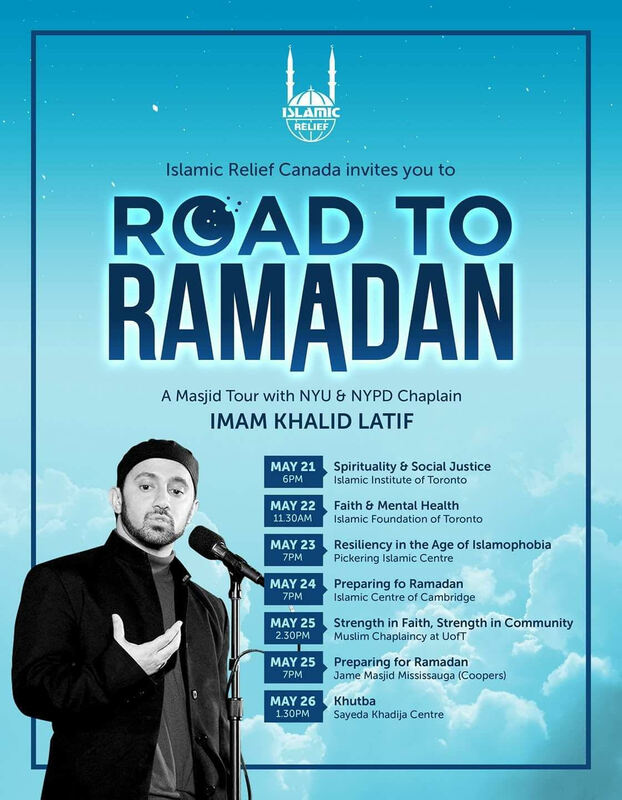 ICC has teamedup with Islamic Relief to host Imam Khalid Latif during his Ramadan Tour on Wednesday 24-May, 2017 at 7:00 PM and Imam Khalid is a renowned activist, the NYPD & NYU Muslim Chaplain so he will be speaking about the preparation for Ramadan - an excellent program for everyone including the youth of our community! 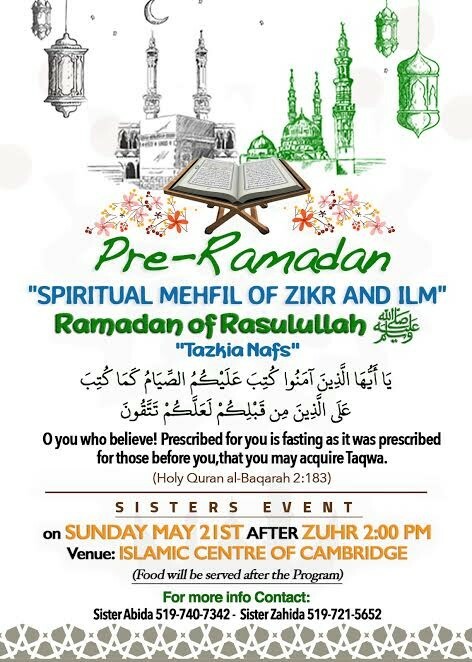 ICC is holding an event for Sisters Pre-Ramadan, "Spiritual Mehfil of Zikr & Ilm" on Sunday 21-May, 2017 after Zuhr at 2:00 PM and food will be served after the program. The centre is asking for help from 20 - 25 Community Members in removing the existing carpet from the main prayer hall so the removal will begin after Zuhr prayer on Sunday 21-May, 2017 (Inshallah). On 14th & 15th May, 2017 | The International School of Cambridge (ISOC) arranged a very successful two-day trip to Ottawa with meticulous planning and organization (Alhamdulillah) so special thanks to Mr. Naseem Mian for booking a tour with Bryan May, MP of Cambridge to the Parliament for the students, staff & parents who went on the trip. During the holy month of Ramadan, the Islamic Centre of Cambridge is holding daily Iftars for our community and on the weeknights, we serve Iftar & Dinner to 80 people approximately, while on the weekends, an average of 150 people are served (Alhumdulillah) so everyone is welcome to signup at the office to sponsor one or more days of Iftar & Dinner and we also need volunteers to help with serving the food for the entire holy month so please contact the office for further assistance. On Saturday (Today) 13-May, 2017 between 4:30 PM & 6:30 PM | Islamic Centre of Cambridge will be hosting it's third family program by Imam Dr. Mustafa Khattab and he is the author of Clear Quran, a modern & unique translation of the Quran. The Islamic Centre of Cambridge is looking for a university student, who may be interested in a job offered at the ICC so for details about the job, please contact Mr. Khokhar. Sister Rukiya Minhas, mother of Dr. Jawad Minhas & Faisal Minhas passed away in Kitchener this morning and funeral will be held this Saturday (Today) 13-May, 2017 after Zuhr prayer at Waterloo Mosque so please make dua for the departed soul and may Allah SWT pardon her sins & give sabr to her beloved ones (Aameen). Alhamdulillah, new carpet rolls for the mosque are here with us so we would like to thank everyone who was involved in the unloading of the heavy carpet rolls and bringing them from curbside to inside the building. We would like to inform you that, the construction on the property will soon begin inshallah and as a result, parking spaces will be reduced so we are hoping for your cooperation & patience in this regard. We need around 8 Volunteers today afternoon on Saturday 13-May, 2017 after Zuhr prayer (for half an hour only) to setup the safety & security fence for the construction so your help in this regard is very much needed and appreciated. On Saturday 13-May, 2017 between 4:30 PM & 6:30 PM | Islamic Centre of Cambridge will be hosting it's third family program by Imam Dr. Mustafa Khattab and he is the author of Clear Quran, a modern & unique translation of the Quran.